Twinsy Tropics is a beach area found in Mario & Luigi: Paper Jam. Set on an island just south of the Mushroom Kingdom, it borders Doop Doop Dunes to the north and Bowser's Castle to the east, with its ties to the latter being a key plot point in the game. Paper Luigi sleeps there when the Music Player option is unlocked after defeating Shiny RoboBowser. 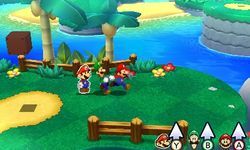 Mario, Luigi and Paper Mario's first visit to Twinsy Tropics came after they tried to cross the bridge from Doop Doop Dunes to Bowser's Castle. After being knocked out by an attack, the trio are taken prisoner by the Chargin' Chuck Corps and imprisoned in the Twinsy Tropics Dungeon. After escaping the dungeon and fighting Wendy and Roy, they end up outside. Finding out that they're trapped on an island in the middle of the ocean, they have to rescue more Paper Toads in order to build a boat back to the mainland. Once this is done, they return to Sunbeam Plains and Princess Peach's Castle. After defeating Papercraft Bowser Jr. near Bowser's Villa on Mount Brrr, the trio get a Bowser emblem item. Figuring out that said symbol was spotted on a wall in the Twinsy Tropics Dungeon, the party returns to the area, using an alternate route from Doop Doop Dunes via some newly created paper islands. They're then shown the entrance to the Twinsy Tropics Dungeon by the Paper Goomba they freed earlier in the adventure, and progress through to Bowser's Castle. The enemies below are the ones found in Twinsy Tropics itself. The ones found in the dungeon can be found on the Twinsy Tropics Dungeon page. Niterude Shotō Pun on ni teru de (似てるで), meaning "alike" or "similar". Shotō (諸島) refers to a chain of islands or archipelago. This page was last edited on February 8, 2018, at 19:30.